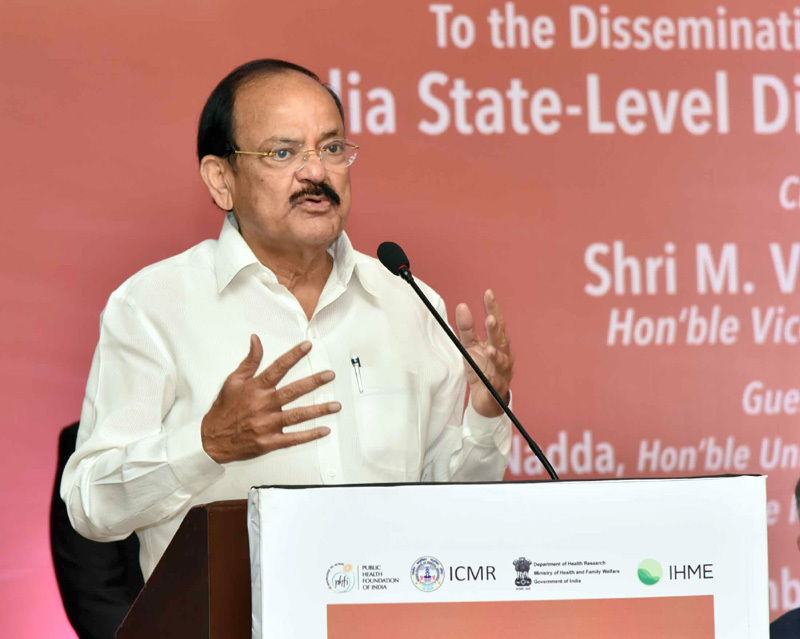 The Vice President, Shri M. Venkaiah Naidu addressing the gathering after launching the India State-level Disease Burden Report and Technical Paper, an initiative by the Indian Council of Medical Research in collaboration with Public Health Foundation of India and Institute for Health Metrics and Evaluation (University of Washington, Seattle), in New Delhi on November 14, 2017. 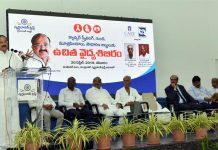 New Delhi : The Vice President of India, Shri M. Venkaiah Naidu has said that the Lifestyle changes and preventive public health should be prioritized. He was addressing the gathering after releasing the ‘India State-level Disease Burden Report and Technical Paper’, an initiative by the Indian Council of Medical Research in collaboration with Public Health Foundation of India and Institute for Health Metrics and Evaluation (University of Washington, Seattle), here today. The Union Minister for Health and Family Welfare, Shri J.P. Nadda, the Minister of State for Health and Family Welfare, Smt. Anupriya Patel and other dignitaries were present on the occasion. The Vice President said that achieving good health for all of India’s population is an important goal of the government of India as a foundation for further social and economic development. He further said that the gap between the highest life expectancy in an Indian state and the lowest life expectancy currently is 11 years, and the difference between the state with the highest infant mortality rate and lowest rate is 4 fold. The Vice President said that many health indicators in India continue to be poorer than some other countries at a similar level of development. He further said that this implies that while significant health improvements have happened in India, we could do better. India has had important national surveys and data from other sources that indicate significant differences in the burden of some diseases between different parts of the country, he added. The Vice President said that the report by the India State-level Disease Burden Initiative released today provides these comprehensive estimates for each state from 1990 to 2016 for the first time in India. He further said that this report, along with the technical scientific paper and the open-access visualization tool that are also released today, together provide systematic insights in to the health status of each state and the health inequalities between the states of India. High disease burden caused by malnutrition in India must be tackled soon to enable the next generation of Indians to reach their full potential in their personal development as well as the nation’s development, he added. 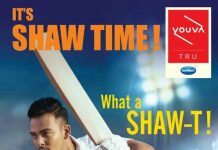 “India is home to almost one-fifth of the world’s population. People living in different parts of the country and states differ in their ethnic origin, culture and in various other ways that influence their health status. Achieving good health for all of India’s population is an important goal of the government of India as a foundation for further social and economic development. Health is wealth. If we have it, we can acquire wealth, but there is no guarantee that you can get health with health. We are living in a global village and the world has become small. We should reaffirm our commitment to give our children a healthy future and a better place to live. Medical professionals should adopt a humanitarian way in treating patients. A responsive performing healthcare delivery system with people cantered reforms can transform the health landscape of the country. Lifestyle changes and preventive public health should be prioritized. The health status of Indians has been improving since Independence. For example, the life expectancy of a person born in India in 1960 was 40 years, which has increased to about 70years now. Of every 1000 live children born in India in 1960, about 160 died in the first year, but now this death rate of infants is about a fourth of that level. These broad improving trends however mask major inequalities between states and between socioeconomic strata. To highlight this, the gap between the highest life expectancy in an Indian state and the lowest life expectancy currently is 11 years, and the difference between the state with the highest infant mortality rate and lowest rate is 4 fold. When compared internationally, many health indicators in India continue to be poorer than some other countries at a similar level of development. This implies that while significant health improvements have happened in India, we could do better. In order to do better, several things need to happen in parallel. These include higher priority for health in the country’s policy making and enhanced resources for preventive and public health measures. There should be adequate mechanisms at the ground level for keeping Indians healthy and for suitable healthcare when they fall sick. We should also have a solid knowledge system that enables comprehensive tracking of the health and disease burden trends in every part of the country. It is on this last aspect that the work of the India State-level Disease Burden Initiative is crucial for health progress in India. India has had important national surveys and data from other sources that indicate significant differences in the burden of some diseases between different parts of the country. But ours is a vast and diverse country. What we require is a more detailed state wise picture for taking appropriate action. Till now, we have not had this systematic and complete compilation of the burden of all diseases and the risk factors behind them for every state of the country in a single framework. This gap is now being filled by the current initiative. The report by the India State-level Disease Burden Initiative released today provides these comprehensive estimates for each state from 1990 to 2016 for the first time in India. This report, along with the technical scientific paper and the open-access visualization tool that are also released today, together provide systematic insights in to the health status of each state and the health inequalities between the states of India. The findings show that the overall disease burden per person in some states of India is almost twice as much as in some other states, and the burden rate due to the leading diseases ranges five to ten times between the states. These inequalities must be addressed. The specific disease burden trends for each state in this report provide a reference for planning interventions that are needed to address the major disease problems in each state. Such evidence-based health planning in each state would result in health improvements in every state, reduce the health inequalities between the states, and help make more rapid progress towards achieving the overall health targets for India. One particular point in the findings released today that needs to be addressed as one of the highest priorities is the continuing very high disease burden caused by malnutrition in India. This must be tackled soon to enable the next generation of Indians to reach their full potential in their personal development as well as the nation’s development. We cannot be complacent about this critical aspect of human development as we try to build a new resurgent India. It is encouraging that the work leading to this report was done by a network of collaborators including many leading health scientists and stakeholders in India representing over one hundred institutions. The guidance of the Director General of the Indian Council of Medical Research Dr. Soumya Swaminathan, and her close engagement with this work over the past two years has been crucial for the success of this work. I congratulate Director General ICMR and all the collaborating individuals and institutions for completing this excellent work. You all have contributed to enhancing the knowledge base. This will be helpful in designing specific targeted approaches for improving the healthcare in our country. I hope to see this national initiative being continued and further enriched in the years to come. I wish you all the best in your endeavours.